On Sunday 8th September the Church was delighted to host the Annual Racial Justice Sunday Service organised by MECTIS [Minority Ethnic Christians together in Scotland] and ACTS [Action of Churches together in Scotland. For the first time this annual national service was held in Hamilton, rather than in Edinburgh or Glasgow. In the year of the celebration of the bicentenary of the birth of David Livingstone the service was held in the building of the congregation of which Livingstone’s parents were founder members, and which in 1966 merged with St. James’ Congregational Church, to which Livingstone walked Sunday by Sunday to attend worship, when it closed. The theme of the service reflected Livingstone’s inspirational quotation ‘I am prepared to go anywhere, as long as it is forward.’ From all the missionaries of his era, Livingstone stands out as a man who was prepared to let the heart of the message of Christianity take root in the fertile culture of the peoples he lived and worked amongst. The service, therefore, reflected the many cultural backgrounds of Scotland’s Christian community. The service was attended by the Provost of South Lanarkshire Council, Eileen Logan, and Tom Greatrex, M.P., Jimmy Hood M.P. and Christiana McKelvie’ MSP. Member churches of MECTIS and ACTS were represented by committee members and representatives and leaders of most denominations in Scotland. Worship was led by representatives of the Churches. 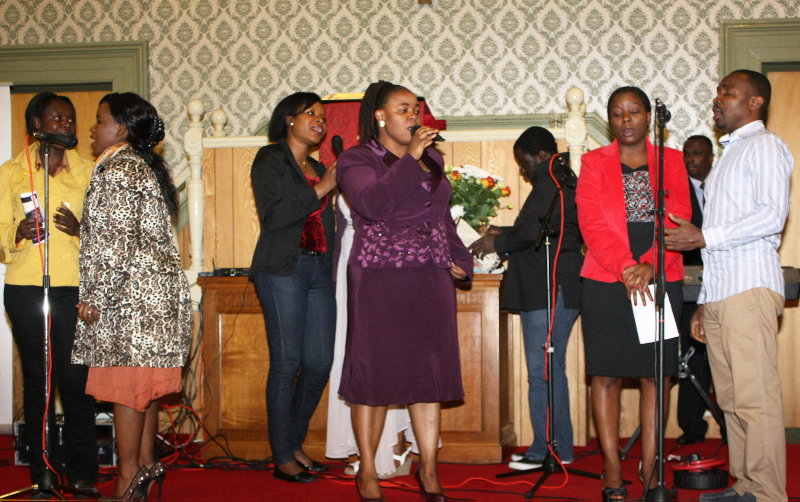 Praise, some of which was in several languages [refrains sung in English] was led by an African choir. The preacher was Rev. Beatrice Musindi, Moderator of the Racial Justice Network of Churches Together in Britain and Ireland. A light meal was served at the close of worship. African Choir singing prior to worship . . .